Fun, brash and frenetic by night, funky and colorful by day, bohemian Adams Morgan is never boring. 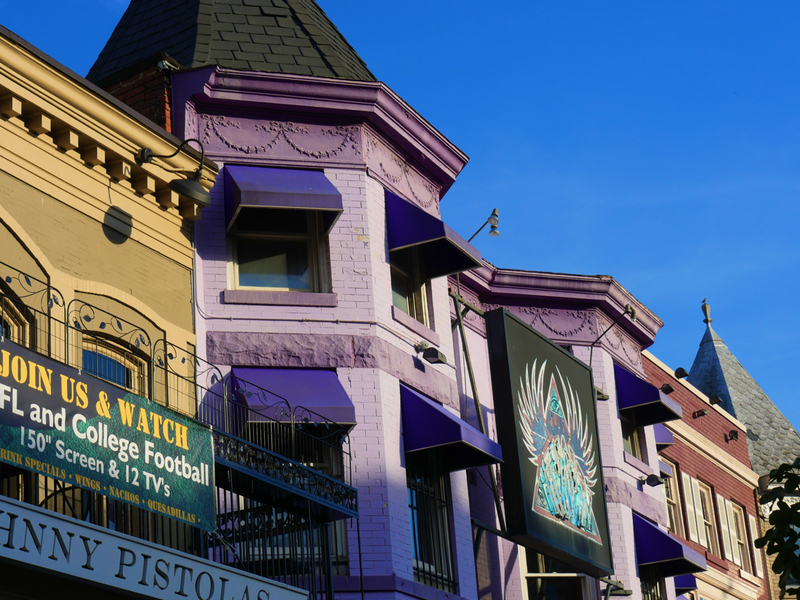 With its Victorian homes, funky shops and eclectic buzz, Adams Morgan is a whirl of sights and activity. Lead friends on a mural photo safari. Savor grilled rabbit sausage and lamb ribs at Tail Up Goat. Belt out a karaoke ballad at Muzette. Enjoy the presidential mural (minus one) at Mama Ayesha’s. Catch an indie musical at DCAC. Tune up at Bicycle Space. Go thrifting at Meeps then splurge on an original at Hierarchy. Slurp a Pleasant Pops strawberry ginger lemonade. Master crow pose at Mint. Be spontaneous, because that’s Adams Morgan. Why should you care about Adams Morgan real estate market data? Because it's the measure of your investment over time! Getting around in Adams Morgan. The Adams Morgan DC neighborhood takes its name from two segregated elementary schools, John Quincy Adams Elementary School for white children and Thomas P. Morgan Elementary School for black children. District schools were desegregated in 1955 and the Adams-Morgan Community Council was created in 1958 to serve both schools and their communities. Adams Morgan’s boundaries were drawn through 4 existing neighborhoods; Washington Heights, Lanier Heights, Meridian Hill, and the Kalorama Triangle Historic District. Its history is borrowed from each of theirs. The Washington Heights Historic District is located in the Adams Morgan neighborhood and includes 347 contributing properties that date from 1891-1950. It was listed on the National Register of Historic Places in 2006. Washington Heights was a mostly white, middle-class neighborhood of single family rowhouses until the early 1920s when immigrants from Europe and Asia began to move in. They started small businesses along 18th Street and worked in neighborhood embassies and homes as staff. The black population began moving into their rooming houses converted from larger homes in the 1930s, especially along Vernon Street. When white families migrated to the suburbs in the 1950s and 1960s, Latinos began moving in, taking advantage of affordable housing and work in Latin American embassies. Their population grew with political unrest in Latin American countries during the 1960s and in the 1970s they were joined by people from the Caribbean, Southeast Asia and Africa, creating a vibrant, multicultural neighborhood. Lanier Heights is one of the early subdivisions created within the District, sited outside of the original, officially-planned City of Washington and two miles north of the White House. Lanier Heights is located within the larger, newer neighborhood of Adams Morgan. Its boundaries are considered to be 16th Street (east), Adams Mill Road and the National Zoo (west), Columbia Road (south), and Harvard Street (north). Like Mount Pleasant and Crestwood, Lanier Heights was developed from a large parcel of land granted to John Bradford in 1714. He named this tract Plain Dealing. In 1763 the parcel was acquired by Robert Peter of Georgetown, who also built the first home in Meridian Hill. The land that would become Lanier Heights was only used periodically for common farming until shortly after the end of the Civil War, when Washington started to develop rapidly. In 1883 the “Lanier Heights Subdivision” was created, planned and financed by Elizabeth Lanier Dunn and her husband General William M. Dunn. A few years later, banker Archibald M. McLachlen and biologist George Brown Goode of the Smithsonian Institution helped shape the neighborhood’s identity as a community for Smithsonian employees and other professionals in Washington. Introduction of an electric streetcar line on Columbia Road in 1897 and construction of The Ontario apartment building (c. 1902-06; converted to a co-operative in 1953) heightened the neighborhood’s profile and increased its population. As time went on, the Lanier Heights subdivision became a well-to-do neighborhood comprised of families, professionals, intellectuals, and city workers, developing in to a diverse compilation of people and cultures. Peter’s Hill, the original name for what is now Meridian Hill Park, was owned by Robert Peter, a wealthy Georgetown merchant. In 1804 President Thomas Jefferson placed a geographic marker there, centered exactly north of the White House, to establish a longitudinal meridian for the city and nation called the “White House meridian”. Commodore David Porter purchased the hill in 1816 as part of a 110-acre tract and named it “Meridian Hill.” Porter built a huge mansion with the same name close to the marker. The home faced south with an excellent view of the White House and the Potomac River. This strategic location prompted the Army to seize the home and hill for use as a Civil War encampment named Camp Cameron. Meridian Hill mansion was damaged by fire following the war and was razed. The property was subdivided, a large number of the lots purchased in 1887 by former Senator John Brooks Henderson and his wife Mary Foote Henderson, a wealthy couple relocating from Missouri. On the west side of newly extended 16th Street, the Hendersons then built an elaborate stone home, designed to resemble a castle, which became known as Henderson Castle. Mrs. Henderson cultivated friendships of members of Congress and lobbied them to help her execute grandiose plans for the neighborhood, including an unsuccessful bid in 1900 to erect a massive presidential mansion there, replacing the White House, and a failed proposal for the site be used for the planned Lincoln Memorial. She finally proposed a park and personally paid for the construction of a string of elaborate mansions and embassies lining 15th and 16th Streets. In 1901, the Senate Park Commission reconfigured the city’s National Mall and decided, again lobbied by Mrs. Henderson, to move forward with plans for a park on Meridian Hill. Meridian Hill Park was officially established by an Act of Congress on June 25, 1910. The Federal Government purchased the land for the park that year and began planning for its construction in 1912, first hiring esteemed landscape architect George Burnap to design a grand urban park modeled on those found in European capitals. His plans were later modified by Horace Peaslee who took over as project architect. The park’s design included a terraced fountain cascade with pools in the Italian Renaissance style on the lower half, and gardens in a French Baroque style for the upper half, later simplified to focus on an open mall to accommodate gatherings and performances. Walls, fountains, balustrades and benches were built with concrete aggregate by master craftsman John Joseph Earley, whose team labored for years on the project. After a nearly twenty year construction period, the grounds were finally declared essentially complete, given park status, and then dedicated in 1936, no doubt to a collective sigh of relief by Congress and all involved.